Home » General Interest » How Do Ants Tell Friend from Foe? 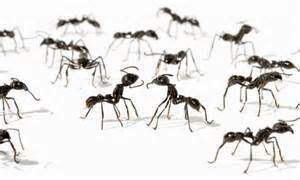 Ants can form colonies that range in size from a few dozen predatory individuals living in small natural cavities to highly organised colonies that may occupy large territories and consist of millions of individuals. They clearly work together in a highly organised way – but how do they communicate – how would they tell freind from foe? Biologists have known for some time that all of the ants from a single nest exude an identical cocktail of volatile substances called cuticular hydrocarbons, enabling them to recognise each other. But how their antennae facilitated that recognition was something of a mystery – until quite recently. Japanese researcher Mamiko Ozaki from the Kyoto Institute of Technology has pinpointed a specialised sensory structure located on the antennae, called a sensillum, which sounds the alert when things don’t smell right. The sensillum is a tiny tube about 0.02 millimetres long and about 0.004 millimetres in diameter, which houses a large number (up to 200) of chemically sensitive nerve fibres. By painstakingly recording the activity in the nerve fibres from the sensillum, Ozaki found that they fired off nerve impulses only when he exposed them to smells of ‘foreign’ (non-nest-mate) ants. Cleverly, the nerves that would normally respond to the smells of nest-mates were deactivated, sorting friend from foe.